Founded by German designer Jil Sander, the namesake line debuted in 1973 with a ready-to-wear collection. The Jil Sander aesthetic is known for its minimal and sharp designs. The collection reflects the designer’s penchant for a classic, understated range of clothing that has earned her the label of "the queen of less." Tiny and unexpected details play a huge role in Jil Sander clothing. Whether it is a gown with a jewel embellished neckline, an elegant brushstroke-printed dress, or a short jacket, Jil Sander stays true to her clean design heritage. 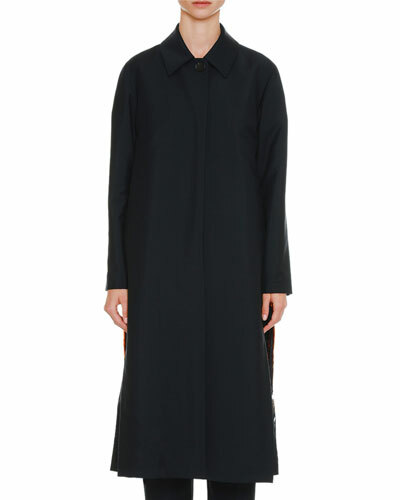 Neiman Marcus offers a great selection of Jil Sander dresses, jackets, pants, and more. Iro "Lana" pants in virgin wool. High-waist; hidden fly. Adjustable d-ring waist belts with grommets. Side slip pockets. Back besom pockets. Tailored fit. Straight legs. Ankle-length. Imported. 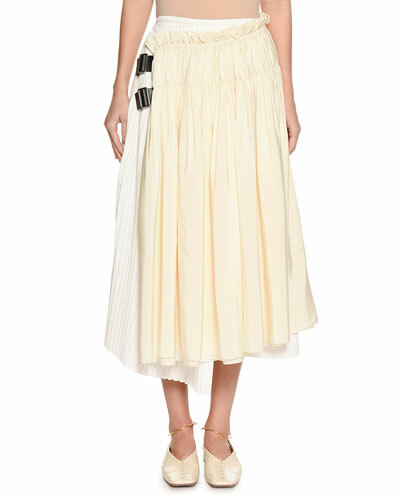 Model's measurements: Height 5'10"/177cm, bust 33"/84cm, waist 25.6"/65.2cm, hips 35.8"/91cm, dress size US 2-4/FR 34-36.
kate spade new york metallic jacquard pants with pleated front. Rear welt pockets. High rise; relaxed fit. Straight legs. Cropped length. Hook/zip front. Polyester/metallic. Dry clean. Imported. Model's measurements: Height 5'10"/177cm, bust 33"/84cm, waist 25.6"/65.2cm, hips 35.8"/91cm, dress size US 2-4/FR 34-36. Misook pants in wrinkle-resistant knit. Smooth, pocketless silhouette. Sits at natural waist. Pull-on style. Slim straight legs. Acrylic/polyester. Machine wash.
Misook pants in wrinkle-resistant knit. Smooth, pocketless silhouette. Sits at natural waist. Pull-on style. Slim straight legs. Acrylic/polyester. Machine wash. Imported. Model's measurements: Height 5'10"/177cm, bust 33"/84cm, waist 25.6"/65.2cm, hips 35.8"/91cm, dress size US 2-4/FR 34-36.